We are very fortunate to meet so many wonderful people through our work at CASA. We are constantly amazed at the time, energy and passion that CASA volunteers give to the children they serve. And we are consistently overwhelmed by the generosity of all of you who support CASA through your donations. YOU are the reason that CASA of Morris and Sussex Counties served 95% of the children in foster care in our two counties during this Fiscal Year (2015-2016). This far exceeds the NJ State average of serving 28% of children in foster care. 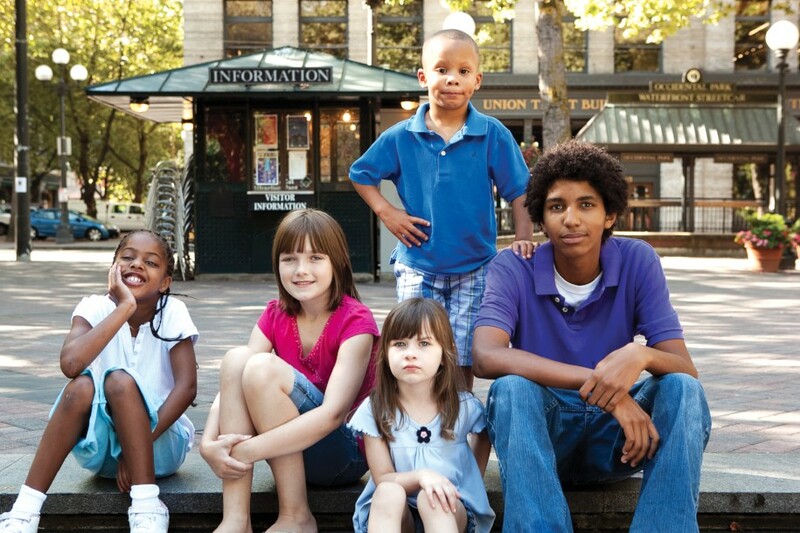 CASA is part of our community’s response to embracing and protecting children exposed to abuse and neglect. We are reminded on a daily basis that child abuse and neglect are not diminishing, but escalating. A child’s emotional, physical, and mental well-being are fragile and easily compromised. This is why CASA volunteers are crucial to ensuring positive outcomes for children in the foster care system. 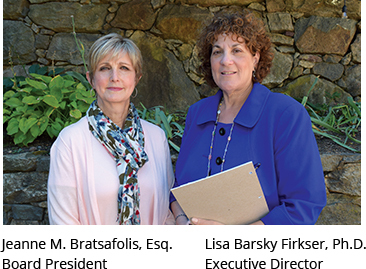 Our volunteers truly make a difference in these children’s lives through their advocacy and unbiased recommendations to the court. We applaud the 163 volunteers who advocated for 363 abused and neglected children in this Fiscal Year. 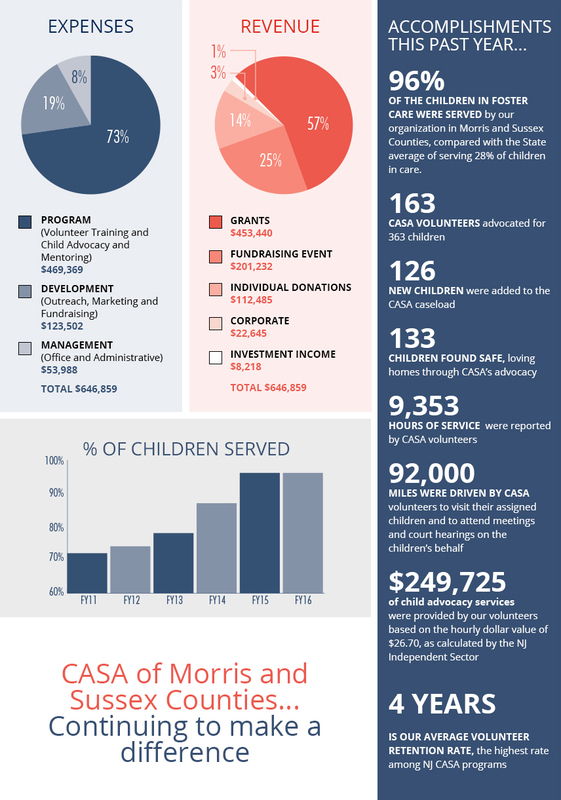 As you review this Annual Report, please know that CASA could not have achieved all that it has without YOUR continued support and commitment to helping protect vulnerable children. This is demonstrated by the numerous accomplishments that our organization continues to achieve as we expand our programs. We fervently hope that all children will be protected from harm, live in a permanent and stable family environment, and receive the services that will meet their developmental, educational, physical, and mental health needs. On behalf of the CASA Board of Trustees and staff, we send a heartfelt thank you to YOU, our donors and our dedicated and resilient volunteers. We invite you to remain a part of our community, championing the best interests of children at risk. Together, we will continue to make a difference. Our community came together to provide birthday presents, holiday gifts, beach towels, backpacks, school supplies, teddy bears, toiletries, and smiles for over 350 children. Attend an Information Session to learn the process to become a CASA volunteer to advocate for a child. Make a tax-deductible donation of cash or appreciated securities. Ask your employer to match your gift to CASA. Honor a family member or friend by sending a tribute card: in memory of, in honor of, thank you, happy birthday, etc. Include CASA in your Will or Estate Plan.